Sometimes, inspiration comes from unlikely sources. This was one thought that ran through my head on Thanksgiving Day in 2011, as I found my name in online news outlets everywhere for the first time. 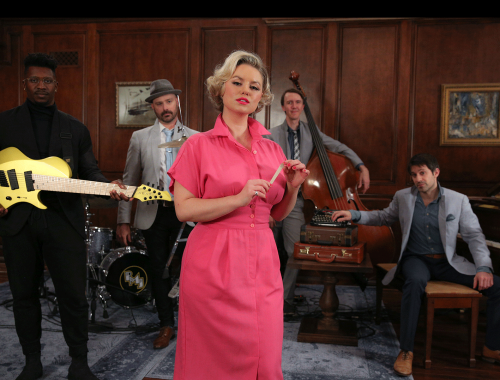 It was the first time a video from what would later become Postmodern Jukebox had made waves in the press, only I had eschewed the Postmodern Jukebox label for a more…provocative band name. It was called simply, “A Motown Tribute to Nickelback.” Yup. My inspiration had come from Nickelback. Nickelback occupies that most notable position in the pantheon of modern music of being both extremely successful and extremely reviled simultaneously. Indeed; it is downright fascinating at how angry some otherwise reasonable people get when the subject of Nickelback comes up. To me personally, they seemed pretty inoffensive in the scheme of things. While I didn’t seek them out, I couldn’t entirely get onboard the Nickelback Hate Wagon, especially when they seemed to play their instruments pretty well, put on a very good show for their fans, and didn’t go around kicking puppies, at least not to my knowledge. I’m fairly empathetic to performers that get bashed by critics, since the criticism leveled at mainstream acts tends to be pretty unfair, seemingly justified as a means to restore order in the world and knock these incredibly successful performers down a peg or two. It’s ok to find Nickelback a bit bland; it’s a whole other thing to call them the “worst band in the world.” I’ve been to quite a few open mics and dive bars in my day; let me tell you with utter conviction that Nickelback is far from the worst band in the world. 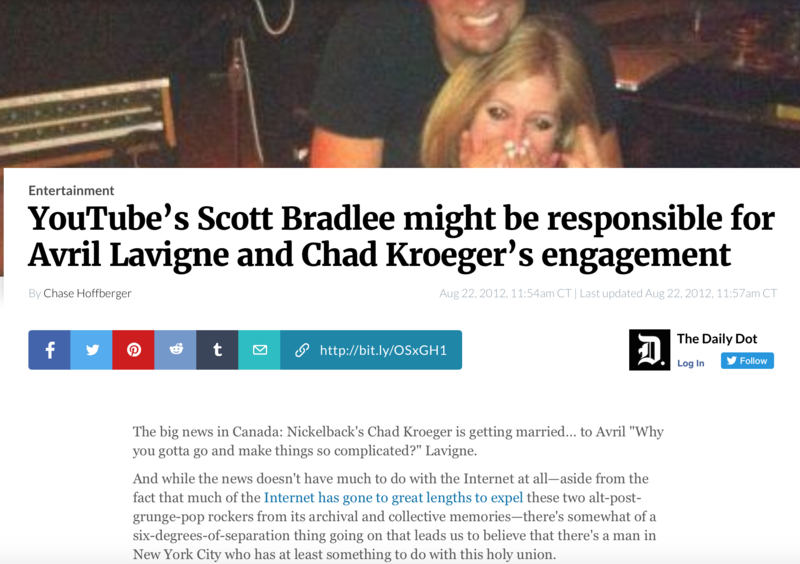 Regardless of my feelings about Nickelback, I did know that their name carried a certain connotation that I was eager to exploit for viral video glory in the Fall of 2011, when I was living in a basement somewhere in Astoria, NY. 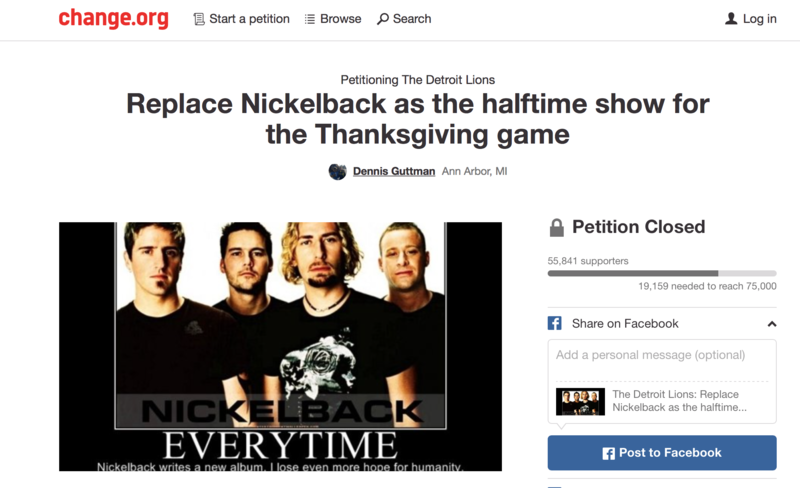 The story went like this: tens of thousands of Detroit residents were so incensed at the fact that Nickelback was booked to play the Lions’ Thanksgiving Day halftime show that they turned to that comfortably low investment form of activism for help: an internet petition. The inspiration for A Motown Tribute to Nickelback. 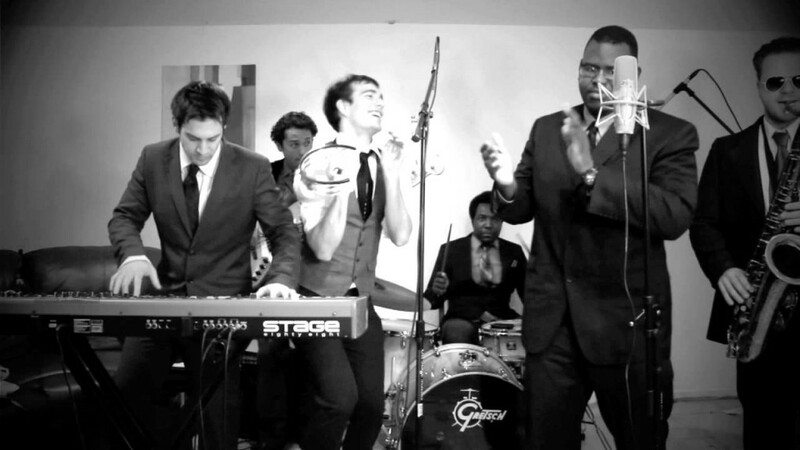 The brainstorming session that led to A Motown Tribute to Nickelback took place over sandwiches in a SoHo grocery store, with two musicians that would become frequent collaborators on PMJ videos- drummer Chip Thomas and kindie musician Tim Kubart. I brought up the fact that I wanted to record a Motown version of Nickelback’s “How You Remind Me” (which at the time, I probably referred to as, “Never Made It as a Wise Man.”). 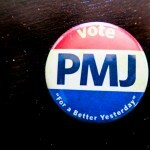 After all, Detroit was the home of Motown — what better way to reconcile the differences between both parties? Both of them wholeheartedly agreed that this was a great idea, and Tim suggested that I include a tambourine player, since a lot of the televised musical performances in the ‘60s included a square-ish tambourine player enthusiastically bopping to the beat. Of course, I loved this idea. “I have a tambourine,” Tim volunteered. “Perfect. 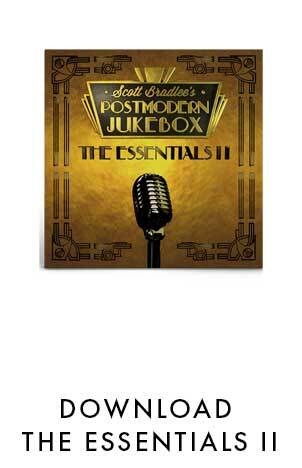 Now I just need a percussionist that can play it,” I said. “I could play it,” Tim said. This was not something I anticipated; Tim was a very good musician and singer, but he was not known for his aux percussion skills. At least not yet. 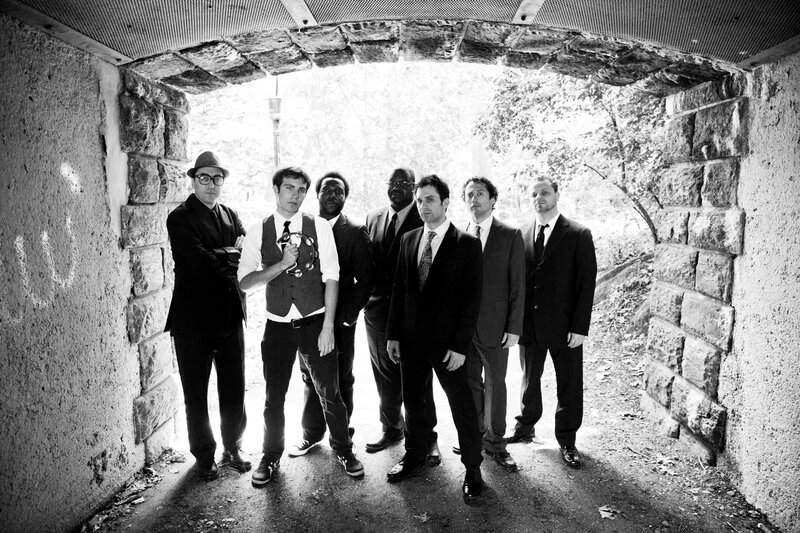 Putting aside my misgivings about Tim playing tambourine, the biggest challenge was to get a soul singer that could convincingly channel the Motown sound and really sell the arrangement that I had put together. I remembered Drue Davis. 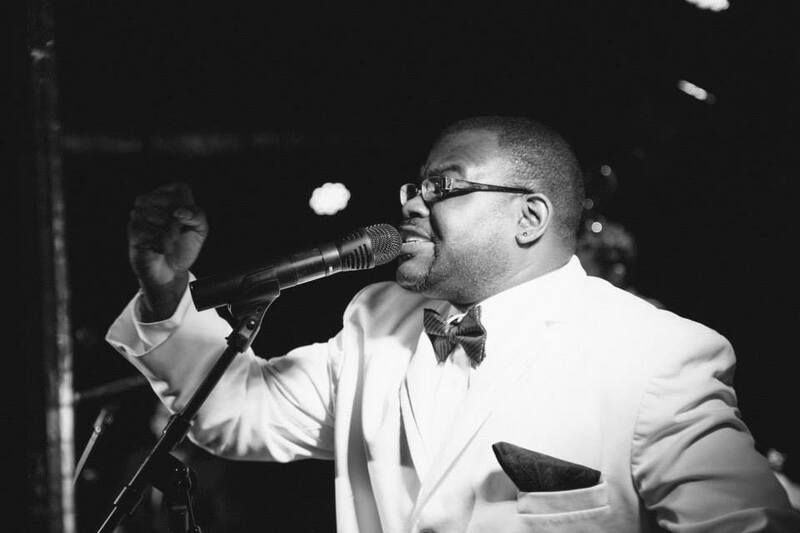 Drue Davis is known mostly as a hip hop producer, songwriter, and emcee, but I had the pleasure of meeting him a few months before on a very different project – a Yacht Rock tribute band in which we both performed. Funny enough, I first heard Drue’s exceptional singing when he was channeling Michael McDonald singing “What A Fool Believes.” I figured Motown Nickelback wasn’t much of a stretch, and gave him a call. I knew it was going to be a tough sell because of the holiday, so I didn’t want to pressure him. I told him to think about it and let me know, and to my surprise, Drue was in. I rounded up the band – Adam on bass, Allan on drums, Steve Ujfalussy on sax, and -after some deliberation- Tim on tambourine, and we all gathered in my basement apartment in the evening of November 23rd to record. I had purchased a brand new Canon DSLR camera to upgrade from my cheap Flip camcorder, and I was anxious to put it to the test. Recording went fairly smooth but ended abruptly at 11pm, when my upstairs neighbor started banging on my door and screaming at us to stop; this was a fairly common occurrence at this point. We packed up, and I got to work editing. This was our Nickelback-esque press picture. I had a restaurant gig in NYC the next morning overlooking the Thanksgiving Day parade – a fun yearly gig at which I would attempt to play the theme music of every float. After that, I raced back to Astoria to release the new video and then drove home to New Jersey to spend the holiday with my parents, wondering if my video would get the intended reaction. 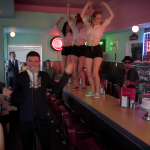 When you watch the video after viewing many Postmodern Jukebox videos, it’s clear that this is as restrained a performance by Tambourine Guy as it gets. 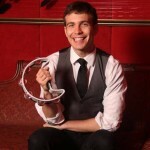 At the time, however, it was just over-the-top enough for viewers to speculate whether it was an act, or if this man was actually that enthused to be playing tambourine in this video. When it comes down to it, both statements are true. 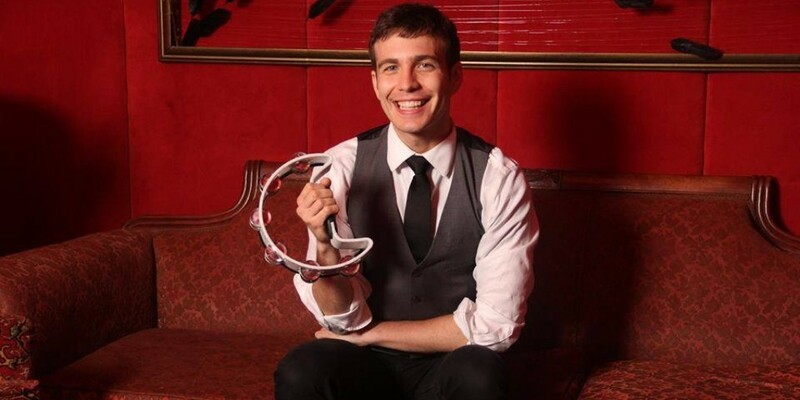 The sheer joy that Tim puts into his performances as Tambourine Guy is infectious; if I’m at a PMJ show and he makes an appearance, I’ll often be as surprised and excited as the audience (he’s pretty much given a free pass to just show up at any shows that he wants to play). Tim summed up the character of Tambourine Guy pretty well by explaining that he represented the desire of every audience member to be onstage performing next to so many great musicians, regardless of whether or not they have the ability. He’s living the dream, and you can’t help but root for him for it. 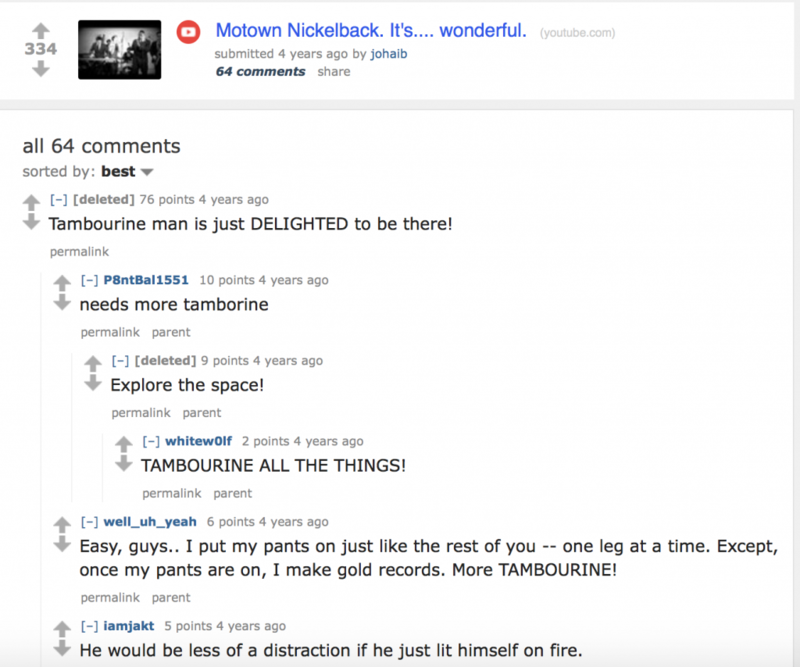 Reddit comments about Tambourine Guy. A Motown Tribute to Nickelback was a huge success, and landed my name all over the internet as the “Motown Nickelback guy.” I even gave a pseudo-academic interview about it to the Village Voice, which resulted in my first epic hater in the comment section of an article. The biggest surprise to come of it, however, came in the form of a phone call by a booking agent for LiveNation, North America’s biggest concert promoter. “We’re booking a festival in British Columbia called ‘Live At Squamish,’ and we wanted to see if A Motown Tribute To Nickelback could perform.” She audibly attempted to suppress laughter, lest I take my life’s work of revamping Nickelback a bit too seriously. “Actually, we’re just looking for Nickelback songs.” So much for that idea. I loved this headline from 2012. 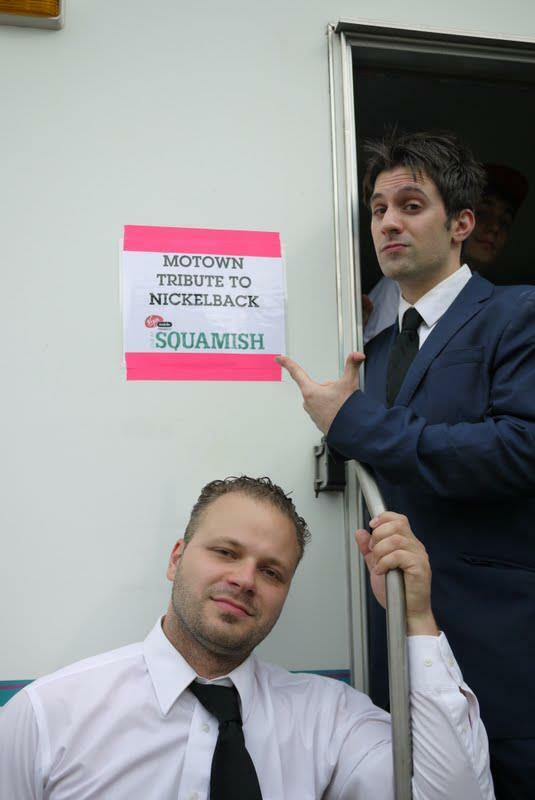 After a few emails and phone calls, A Motown Tribute to Nickelback was booked for Live At Squamish, a legitimate festival that featured real acts such as Chromeo, Charles Bradley, and others. 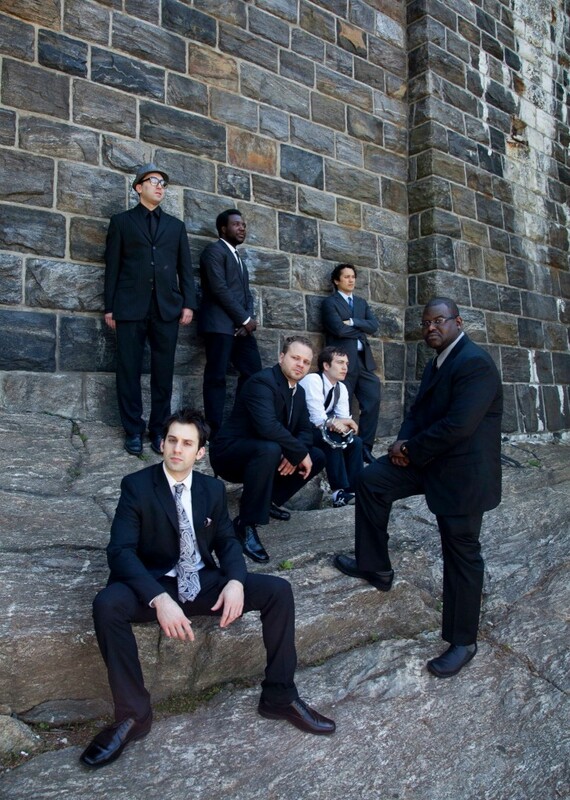 Since we had no press photo or bio and LiveNation was hesitant to use the low resolution still shot from the video that I provided them, I organized a faux dramatic photo shoot in the Cloisters. The photos were pretty funny; in some of them, Tim was the only one smiling, naturally. I also wrote a bio that described us at a group that “painstakingly translates every song in the Nickelback catalogue into the Motown genre.” I like the image of us dissecting every new Nickelback song and turning out Motown remakes like some kind of bizarre fraternal order of mad scientists. Motown Nickelback photo shoot. Don’t look at the camera! All this helped to be taken seriously by LiveNation, but it failed to legitimize us elsewhere. When our name appeared on the festival fliers, most people assumed it to be a joke played by a disgruntled intern. I decided that the next step was to record an album—after all, we had to learn a set’s worth of Nickelback songs anyway. It would be a fun experience, and I figure it was about time that I made my music commercially available. I didn’t have much money saved up, so I turned to Kickstarter to raise the necessary funds. The project was quickly funded, perhaps for the sake of curiousity, and we released our first and only album: A Motown Tribute to Nickelback. You can get the album on iTunes here. 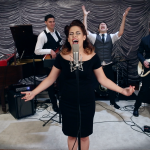 Another track from A Motown Tribute to Nickelback. The funny part about singing Motown Nickelback songs to yourself on the subway is that to others, it sounds exactly like real Nickelback. This was a unique problem that Drue faced when he took on the challenge of memorizing the lyrics of 8 Nickelback songs. Fortunately, Drue is a real pro, and was able to shake off any embarrassment he might’ve felt when his friends asked about the weird Nickelback project he was involved with. He not only learned the songs, but he brought them to life, delivering them with such honesty that they never felt like a joke. Although I realized that there was some humor in what we were doing, I never wanted the project to drift too far towards parody. There’s something much more interesting about taking these songs seriously and not giving in to peer pressure to deliver everything with a wink and a nod. Sax player Steve Ujfalussy and myself, living the dream. The actual festival debut of A Motown Tribute to Nickelback was one of the most memorable moments of my life. Everything about this was exciting to us; our trailer that was marked, “A Motown Tribute to Nickelback” on the door, the artist-only tent with free snacks and beer, the pre-show soundcheck in which we pretended to know what we were doing (“can i get a little more 2K in my monitor?”). Nothing prepared us, however, for the excitement of playing in front of 1000 people for the first time. There were about 100 people there at the start of our set- not many, but this was still significant since they were clearly fans, and we had never met fans before. 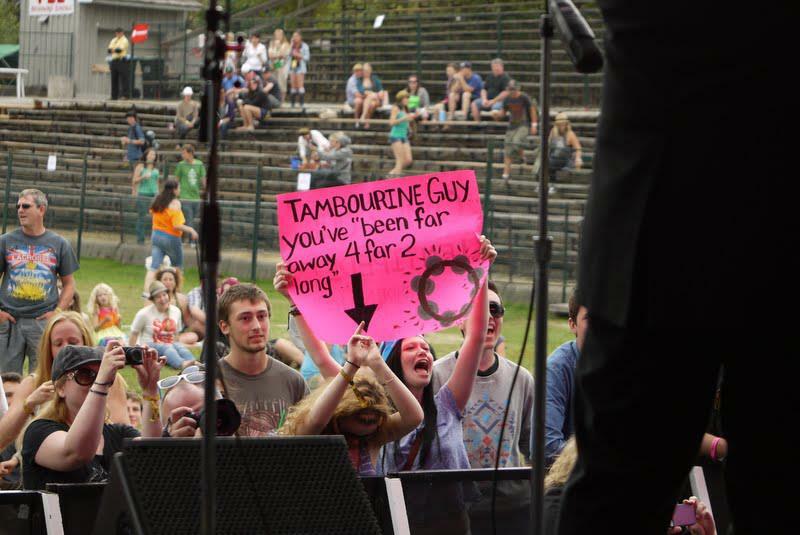 One girl had even made a very conspicuous “TAMBOURINE GUY!” sign, which was pretty exciting for Tim. As the set went on, however, the audience doubled, then doubled again, then doubled again, until the energy from the crowd reached a fever pitch and everyone was singing along to us (well, to Nickelback, anyway). The high point definitely occurred during the song “Rockstar,” when Drue caught a bra thrown onstage mid chorus. We were buzzing for quite sometime after this performance; we even kept our suits on after our set and walked back and forth across the festival grounds, so that fans could recognize us. There were a few post show interviews given that probably should be destroyed, since we were drunk on Canadian beer and local fame. I had no idea back then that was just a taste of things to come. Why are we giving an interview on a construction site? We may never know. the one you’re waiting on.